Pictured: Bombay Variety. 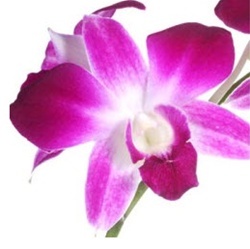 Our dendrobiums are long stems 22 to 24 inches tall. The most mature, larger blooms are at the base, with the newer, small looms toward the tip. These beautiful orchids showed up on my doorstep right on time. They were beautiful upon arrival and only got better the next day! I used them for my bridal bouquets and reception centerpieces. Wouldn't have changed a thing!